Firstly, YAaaaaaar! 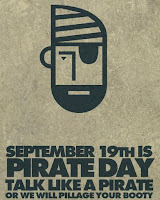 Happy "Talk Like a Pirate Day"﻿. 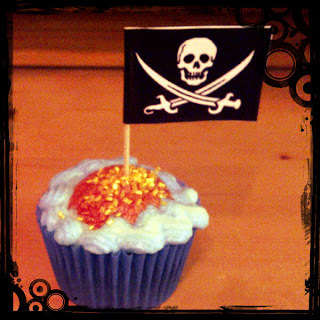 To celebrate this 'holiday' i made some pirate themed cupcakes. They were made with vanilla cupcakes coloured blue (using my good old Americolor gels) and then the design idea was to have a desert island in the centre of a blue buttercream ocean, with a pile of gold booty on top of the island with a jolly roger flag sticking out of the middle of the gold. To finish it off I had planned to make shark fins with marshamllow fondant to put in the buttercream waves. Unfortunately my buttercream was not stiff enough, I'm gonna blame my new hand mixer for this one. It was very difficult to tell if the consistency was right, when I used my old mixer I could tell from the feel when it was ready. Anyways, here is my finished result. They don't look too bad but I had a way more awesome looking cupcake in my head, it was just very hard to translate it into being. 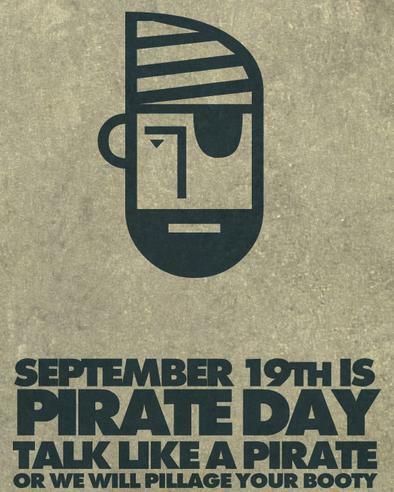 The jolly roger flags were made from searching the images on google and using word to put two of them together so that they could be wrapped around a tooth pick and glued.